In 1928 Irving Schott crafted the first motorcycle jacket; no one could have predicted its long term impact on the fashion industry and continued popularity among customers. Whether cutting the leather by hand, negotiating with the company’s first ‘sales force’ or dealing with suppliers, Irving’s trademark was his Cuban cigar, the ‘Perfecto’. Much like Groucho Marx, Winston Churchill and George Burns, Irving’s cigar became his personal accessory. Schott motorcycle jackets were featured in the cult classic movie ‘The Wild One’ starring Marlon Brando and Lee Marvin. The increased visibility of the jacket and its subsequent popularity actually resulted in decreased sales. The jackets were banned by many schools around the country because they symbolised a burgeoning teen demographic, ‘the hood’. 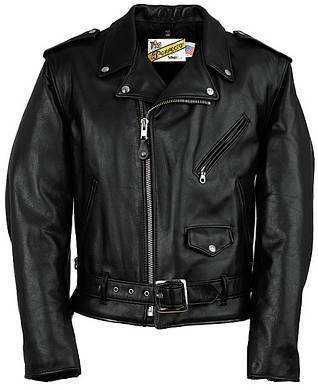 The original motorcycle jacket was designed for Beck distributors, a motorcycle distributor in Long Island, New York. It retailed for $5.50! Soon after, Irving Schott introduced a line of motorcycle jackets under the Perfecto brand name. Since the early fifties, only the top of the line Schott motorcycle jackets carry the Perfecto label. Today you don’t need a gang to wear black leather! Made from deluxe heavy steerhide, the Perfecto is 24″ long and features a belted front, bi-swing back, underarm ventilation, zippered pockets and sleeves and an insulated nylon quilted lining. It is recommended that you order one size larger than usual.